Nothing beats indigenous stew! With this yummy recipe, one gets to enjoy the unique taste of fresh vegetables and other condiments all in one taste. 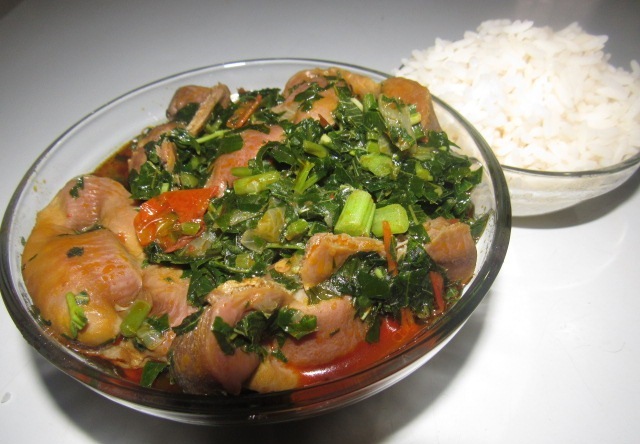 Nigerian oil-less vegetable stew is a healthier choice of stew to opt for instead of the oil-based stew. Blend the pepper, tomato, ginger, and garlic into a smooth paste. Place a pot on heat, then add the paste and cook for 10 minutes. Add chopped onions, crayfish, seasoning cube, salt and then stir properly. Cover the stew to cook for five minutes. Add the smoked fish, meat(beef, saki and pomo), the chopped spinach. Stir well and cover the pot. Allow the vegetable to cook for just 3 minutes on low heat. Add the seasoning cube and a little water to the pot if it appears dry. Cook for five minutes and dig into this African delicacy.